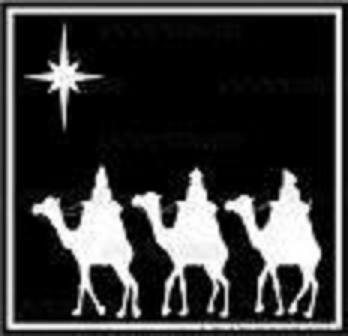 When I was growing up my mother never took down the Christmas tree until after January 6th, which is Three King’s Day, or the Feast of the Epiphany. 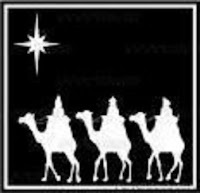 In many parts of Europe, including Austria, Germany, and Switzerland, the Christmas celebration does not end until this date - the day Gaspar, Melchior, and Balthasar arrived at the manger in Bethlehem. Traditionally, on this day, European children will ransack the tree for the sugar treats that decorate it. We never had candy on our tree at home so the only excitement we had on January 6th was finally being able to add the three king figurines to our nativity crèche. 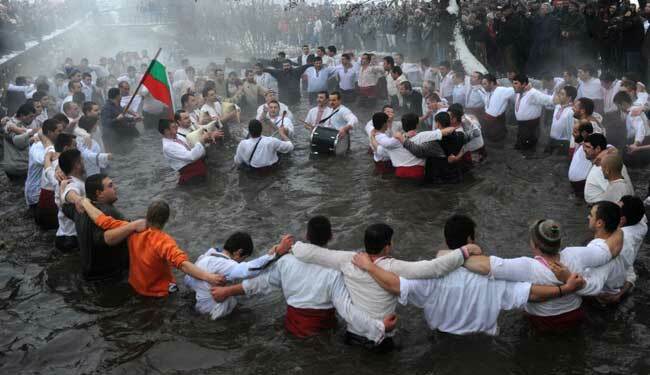 Things get pretty exciting in Bulgaria though on the Epiphany. On this day, a traditional all-male horo dance is performed in ice-cold water. In Greece, where it’s at least a little bit warmer, a priest will bless the oceans and cast a cross into the water, whereupon the men present will dive in after it. He who retrieves it is then blessed with good luck. These Eastern Christian celebrations entail water because they generally commemorate all of Jesus' childhood events, particularly his baptism in the Jordan River by John the Baptist. Although the particulars of another custom vary from region to region, many European countries celebrate Three King's Day by baking King Cake. 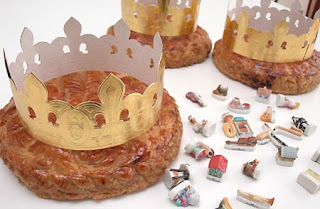 In France it takes the form of a puff pastry with almond filling, called galette des rois; in Holland it’s King’s Bread; in England it’s called Twelfth Cake, a rich, dense fruitcake. Almost always, a coin, a bean, a ring, a plastic figurine of a king or baby Jesus, or some other trinket is hidden inside the cake and the person who gets the piece of cake with the trinket becomes “king” or “queen” for the day!